Next week sees the DVD release of a fascinating but short-lived show from my childhood. The title explains it all. Manimal is about a man who can transform into animals. Happens all the time, of course, but I remember it fondly. It stars Brit Simon McCorkindale (who sadly passed away a couple of years ago) as a wealthy shape shifter who assists the police in all manner of cases where transforming into a panther or a bird of prey was useful. It only lasted for one season in the early 80s. Its demise was perhaps due to Manimal’s continuity-defying indestructible suit, or the frustrating tendency to morph into the above-mentioned big cat or bird, when theoretically the full range of animals was available (I always wanted to see elephants or giraffes but the writers thwarted me in every episode). Naturally, I expect it will have dated just as much as some of my other favourites from the era (Knight Rider, The A-Team, Airwolf, Street Hawk) but for nostalgic reasons, I will be watching Manimal again. For an interesting look at a product of its time, I recommend you have a look too. 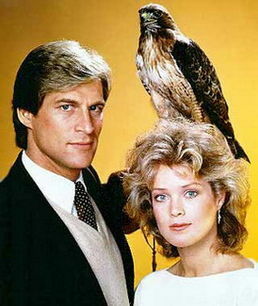 Manimal – The Complete Series out on DVD 27th August 2012! ← UK DVD Release Dates: SMASH! S1, House S8, ALPHAS S1 and Breaking Bad – Season 4!